This recipe debuted in the 1950s. Melt butter or margarine in shallow pan over low heat. Stir in seasoned salt and Worcestershire. 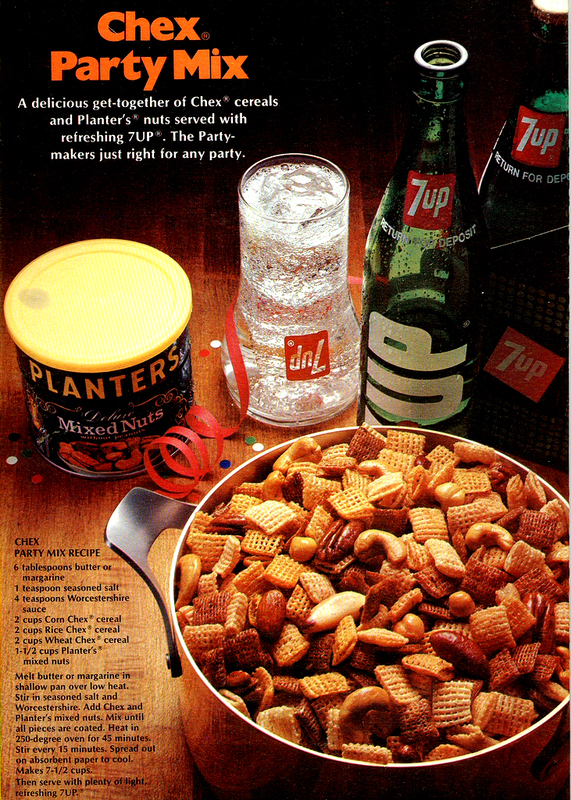 Add Chex and Planter’s mixed nuts. Mix until all pieces are coated. Heat in 250-degree over for 45 minutes. Stir every 15 minutes. Spread out on absorbent paper to cool. Makes 7 ½ cups. I found this delicious recipe here. Preheat oven to 300°F. Line a jelly roll pan with foil or parchment. If using foil, spray lightly with non-stick spray and set aside. 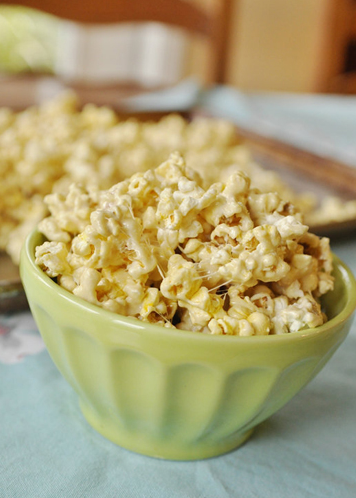 Place popcorn in an extra large mixing bowl. Place butter and syrup in a sauce pan on medium heat. Stir until butter is melted. Add sugar and Jello and stir to combine. 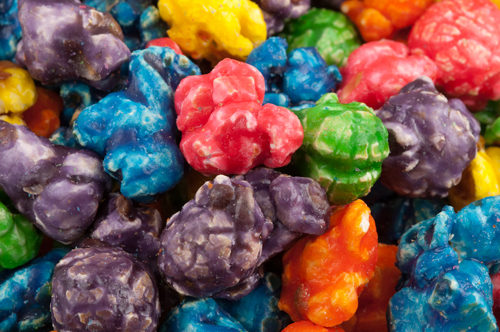 After the sugar mixture simmers for 5 minutes, immediately pour over popcorn in bowl. Mix right away and keep stirring so everything gets well coated. Spread mixture onto prepared pan and spread out evenly. Pop in the oven and bake for about 10 minutes. Remove the pan from the oven and let cool to room temp. Then break into pieces. You can certainly eat this un-baked as well and it’s just soft and gooey, but definitely bake it if you’re going to pack it up for giving, or serve it as party food so it will be light and crunchy. 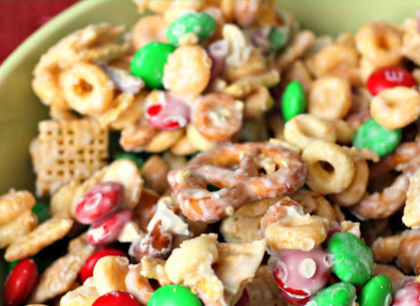 After the sugar mixture simmers for 5 minutes, immediately pour over popcorn in bowl. Be careful, it’s super hot!! Mix right away and keep stirring so everything gets well coated. Spread mixture onto prepared pan and spread out evenly. Remove the pan from the oven and let cool to room temp. Then break into pieces and enjoy! You can certainly eat this un-baked as well and it’s just soft and gooey, but definitely bake it if you’re going to pack it up for giving, or serve it as party food so it will be light and crunchy. Picture and recipe from California Almonds Ad. Directions: Spread almonds in a shallow pan. Place in a cold oven; turn oven to 350 F and roast 12-20 minutes, stirring occasionally, until well roasted. Over medium heat in medium saucepan, heat honey and butter to boiling. Reduce heat to medium low, simmer 2 minutes stirring occasionally. Add almonds; simmer and stir for another 2 minutes. Using a slotted spoon, transfer the almonds to a baking sheet lined with parchment paper(I used wax paper) or sprayed with non-stick cooking spray. Spread the almonds in a single layer and cool slightly. 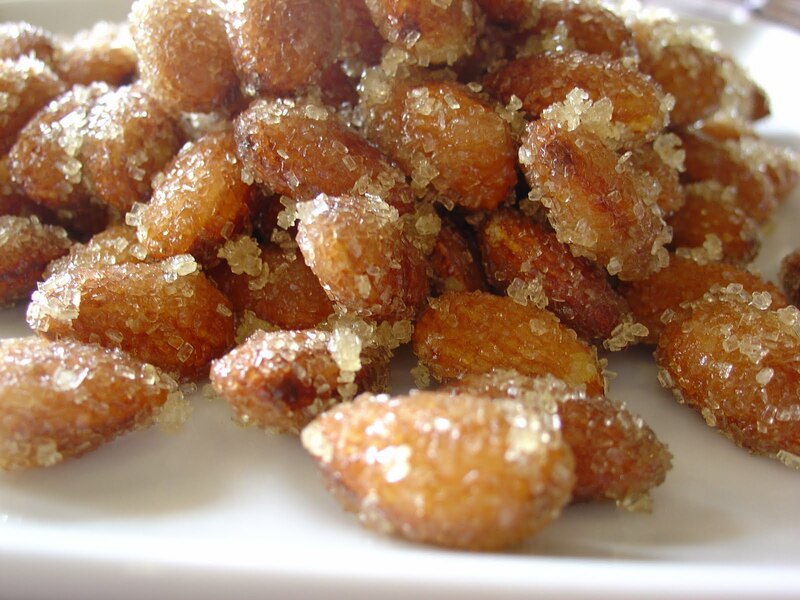 To coat, toss almonds with sugar in a medium plastic food storage bag.